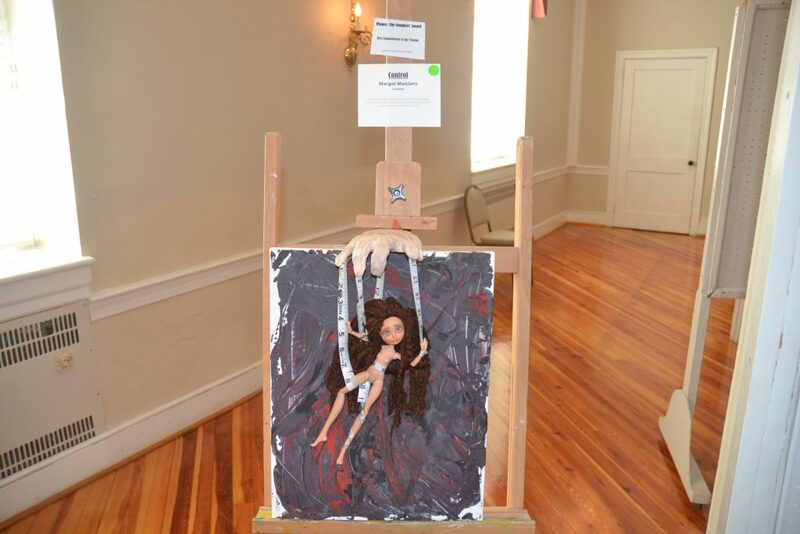 Haddonfield Memorial High School sophomore Margot Masclans’ submission, “Control,” won the Founders Award for “Best Embodiment of the Theme” of the “Through a Woman’s Eyes” art show, featured at The Haddon Fortnightly on April 6. The program was organized by Haddonfield Memorial High School’s 50/50 Club in concert with The Haddon Fortnightly women’s club, and made its debut three years ago. All proceeds from the show are donated to Girls Learn International, a charity that supports education for girls around the world. HMHS senior Devi Bass, who has served as president of the 50/50 Club for the past two years, said the idea for the show was hatched through an interesting mental exercise. “The other person who helped put this together, who is two years older than me, the experiment they always did with people was ‘name five artists.’ And they were always male. You can name Van Gogh, Monet, but can you name five female artists? You can maybe get Frida Kahlo … then you run out,” Bass explained. Bass talked about one particular submission, a shadowbox of pieces that represented different stages of a woman’s journey through breast cancer. The artist, Diane Genco, decided to lay bare her experience for all to see. Bass agreed that was a crucial component of the gallery: when vulnerable, an artist becomes empowered through showing that experience in a public forum. “There’s no fear, there’s no thinking, ‘I’m a woman and I can’t do that job, I can’t go into that major in college.’ Our subtitle for this show is ‘year of the woman,’ just because we felt it was such a year for women on the broad political scale, and we wanted to bring that into this show,” Bass said about her own personal takeaway from organizing the endeavor. HMHS sophomore Margot Masclans, whose work “Control” won the Founders Award as the submission deemed “Best Embodiment of the Theme” for the show, offered thoughts behind her own artistic process. “I wanted to incorporate a lot of multimedia things, because I like to create a lot of different art pieces. For this one, I was thinking about women, and how so much of what we do and so much of how we think about ourselves, is controlled by what other people have told us. And how we view ourselves, it allows society to take control,” she said. Lucy Herdelin, an HMHS senior and vice president of the 50/50 for the last two years, recognizes things like the art show lead women to visibility and the ability to be heard, which translates to opportunity and power. “A lot of people think about careers in the arts and think there are no opportunities, but that’s not the case. Every student in America has had an art teacher, and if that’s something you think you can do, if you have that artistic ability and that passion, then that’s an opportunity,” she said. Herdelin, who has the chance to study modern language in college next year, knows she’s standing on the shoulders of giants who paved the way in previous generations. “My older sister’s studying to become a chemical engineer. Watching her experience and comparing it to every story I’ve ever heard from the older women in my family, it’s so drastically different. She’s going to study in China over the summer, and that’s an opportunity that wouldn’t have been available to her 20, 30, even more years ago,” she said. In the past two years, “Through a Woman’s Eyes” has raised more than $6,000 for GLI via the art show alone. Faculty advisor to the 50/50 Club, HMHS social studies teacher Margaret Gammie, estimated this year’s show brought in more than $2,000, helped along by one of the finest days in early spring. Herdelin confirmed that ticket sales, artist fees, raffles and purchases of the artworks contributed to the total. For more information on the HMHS 50/50 Club, contact Gammie at mgammie@haddonfield.k12.nj.us.